Everybody is a “first-timer” once. When you don’t do things very often, you may feel like a “first-timer” more than once. Doing a direct mail marketing campaign can be exactly one of those things. Some companies will hop on the bandwagon with great enthusiasm. They will target what they perceive to be a great market/group. Get some awesome postcards or brochures printed. Get a mailing list together depending on their target market. Get all this together, let them fly – and then…. Nothing. Like a lot of things in life, there are many ways to do anything. The above scenario is a frequent path by those starting out. Usually they want to save money as much as possible because the whole direct mail approach is new to them. They are hesitant to pour a lot of money into an unknown marketing angle. We understand that – we feel exactly the same way about new uncharted territories! Having an initial fail, particularly when things are done sort of piecemeal on your own, is not unusual, NOR is it a reason to throw in the towel. Despite what you may take as proof that direct mail does NOT work – direct mail DOES work and it has been proven time and time again! If it doesn’t work, why does YOUR mailbox always seem full of it?? Do you want to take out the serious frustration and guesswork from your Raleigh postcard bulk mailing campaign? That’s why people come to Limelight. For a number of reasons: we’ve been around for over a decade, we’re familiar with the Raleigh NC market, we have experience with a NUMBER of different industries and target groups, because we offer incredible graphic design work, because we know how to get the best mailing lists, because we’re small and we want to see OTHER small businesses succeed, because we CARE… we get results for your campaign. 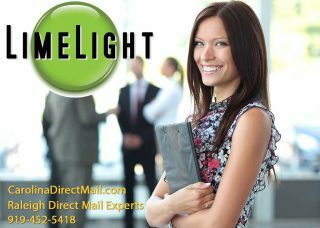 Limelight can do a direct mail Raleigh NC campaign for you as an all-inclusive project or even as a piecemeal project. If you are just getting into the direct mail marketing arena, why not let us do everything from start to finish for the first few times? For all the reasons listed above, we expect to get each customer/client GREAT results. As you gain insight and knowledge into the whole process, then branching off and maybe picking up some of the pieces on your own might be a good move. We’re all about saving you, as a customer, money and encourage you to do whatever part of the campaigns that you can – but never at the expense of RESULTS. Results are the key factor in all of these equations. If we feel that something you have brought to us will put a damper on your results, we’ll tell you. YOUR success is truly our success. Want to learn more about the direct mail services that Limelight provides? Give us a call today and let’s talk about your next campaign.